The Army is overhauling the fitness mission and developing new standards for tactical fitness and health and wellness. The standard PFT of pushups, situps, and a 2 mile run will soon be replaced with a more rigorous test that actually challenges the soldiers in all the elements of fitness besides upper body strength and cardiovascular endurance. Now the test also tests leg strength and power, upper body power and muscle stamina, grip, core strength, and speed and agility. The new exercises that replace and add to the test are: Trap Bar Dead Lift, Shuttle Run (with carry, drag, sprint events), hanging knee ups, hand release pushups, and full body power creation using medicine balls. Having a job in the United States Armed Forces requires the applicants, recruits, and active duty / reservists to meet certain standards of fitness and health. Part of the health screening is to measure your height and weight and if that does not meet the standards within the Army, you will have a secondary measurement of the Tape Test - using a tape measure on the waist and neck. U.S. Army soldiers are subject to physical demands. As a result, the Army has promulgated weight and body fat standards to make sure individual soldiers are in shape to meet the challenges of Army service. The body fat standards replaced the Army's weight requirement in 2013. They are designed to account for soldiers who are heavier than allowed by Army weight tables, but who have low levels of body fat. The standards apply only to soldiers who already are part of the U.S. Army. New recruits have different standards. U.S. Army soldiers are screened at a minimum of every six months to make sure they meet the body fat standards. Soldiers are weighed, and commanders use a weight-for-height table to determine if a soldier meets the standard. For men, the weight-for-height requirements convert to a body mass index (BMI) rating of at least 19. Body mass index, or BMI, is calculated by dividing your weight (in kilograms) by your height (in centimeters squared). A BMI of less than 18.5 is considered underweight and over 24.9 is considered overweight, according to the National Institutes of Health. Male soldiers between ages 17 and 20 must have a BMI of 25.7 or less; men 21 to 27 years old must have a BMI of 26.4 or less; men ages 28 to 39 must have a BMI of 27.1 or less; and male soldiers ages 40 and older must have a BMI of 27.5 or less. One of the least precise methods to measure someone's body fat / lean muscle mass is through the use of the BMI protocol. However, for those with greater muscle mass than fat that skew the results of this test, there is another option to be measured using the Army approved method of body fat measurement - The Circumference Test. If a soldier fails the first part of the screening (the weigh-in and check on the weight-for-height table), then commanders may direct a body fat assessment. If the soldier also fails that assessment, then he will be enrolled in the Army Body Composition Program. Commanders also have the authority to direct a body fat assessment "on any Soldier that they determine does not present a Soldierly appearance, regardless of whether or not the Soldier exceeds the screening table weight for his or her measured height, according to the regulations. Soldiers with major limb loss. Major limb loss is defined as an amputation above the ankle or above the wrist, which includes full hand and/or full foot loss. It does not include partial hand, foot, fingers, or toes. Soldiers who have undergone prolonged hospitalization for 30 continuous days or greater. 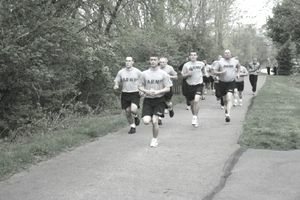 New recruits.These recruits, regardless of component, will have 180 days from entry to active service to meet the retention body fat standards established in this regulation. Army Regulation 600-9 states that Males are allowed the following Body Fat Standards. However, all personnel are encouraged to achieve the more stringent DOD goals which is 18 % body fat for males and 26 % body fat for females. Failing height / weight and body fat standards have a cost. Army personnel who are overweight, or worse obese, including Soldiers who become pregnant while on the weight control program are not promotable to the next higher rank, will not be assigned to command leadership positions, and are not allowed to attend professional military training schools. Not meeting the standard can cost you career enhancing opportunities that may only be offered on occasion. The body fat percentage is determined by measuring the soldier's neck circumference and abdominal circumference three times each, and then subtracting the average neck circumference from the average abdominal circumference. These figures, combined with the soldier's height in inches, allows the soldier performing the calculation to obtain the total body fat. Unfortunately, the circumference test to determine body fat percentage is not the most accurate measure of methods. However, the percentages to fail the body fat percentage test in the Army is fair. Of course, people who are borderline failing will disagree, but body fat in the 20+ percentage area is high for such a dangerous profession as a military member where your life or your buddy's life may depend on your physical ability to carry yourself or others our of harm's way. What Are the Weight Standards for the Navy?